Star Throwers runs two charity shops, which are important for raising funds to support the charity but also for raising awareness of the services that we provide. If you are interested in joining our volunteer team who help support the day-to-day running of the shops, please contact us for more details. 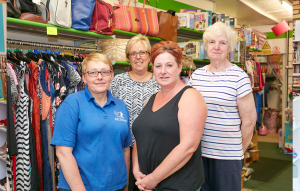 We are always looking for donations of good quality clothes and items (Charity Shop Donations), goods can either be delivered directly to our shops or to our centre on Melton Road in Wymondham which has free accessible parking. We can also arrange for local collection of smaller items, contact us to arrange.